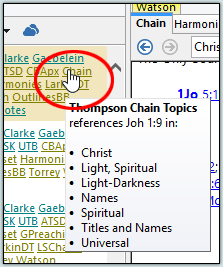 The SwordSearcher Bible panel can show links in the right margin making it easy to quickly access material related to the displayed verses. This is called the margin area and the links are called margin links. If you do not need the links, they can be turned off with the toolbar buttons, and you can also control which library resources are included in the margin area. 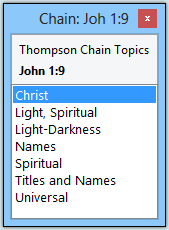 Clicking on an entry title, such as "Unknown, Christ" in the above sample, would load that entry in the Book panel with the verse reference highlighted. The margin area in the SwordSearcher Bible panel is dynamic -- it always reflects the material you have in your SwordSearcher library. 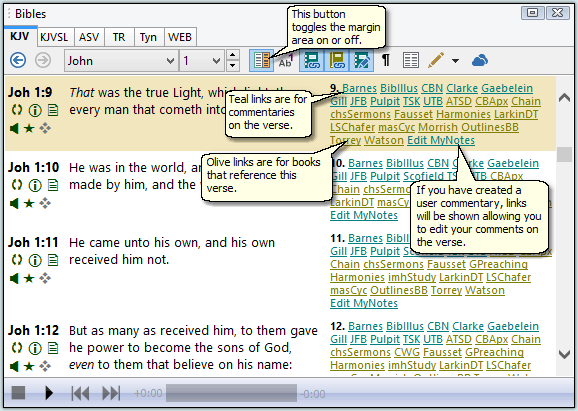 You can disable the display of commentary and book links by using the toolbar buttons at the top of the Bible panel. Also, you can choose which library items are included in the margin area in your SwordSearcher preferences. This is found on File > Preferences > Bible Margin Links.